This weeks under a fiver is The Beacon in Wellington. The Beacon is well known for cheap beer on Thursdays, but before ‘spoons opened, it was the only thing close to a pub lunch in the centre of Wellington. The Jacket Potato with Cheese and Beans. £2.99 at the Beacon. The Beacon tweeted the £2.99 Diamond Club offer, and dared me to go along and review. I do this completely unannounced and I don’t identify myself at the end either. It’s the only way. You can’t buy favour on Telford Live. I’ll admit that the ‘Diamond Club’ threw me a little. Was I expected to show my bus pass to get the deal? After a small exchange on Twitter, my mind was put at rest,although I do wonder how many others are put off with the Diamond Club tag? As I walked in the door, the first thing that struck me was how quiet this place was. 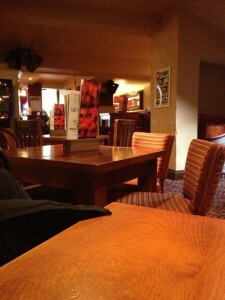 I’ll admit to being a regular at Wetherspoons, and used to big pubs being busy. This isn’t the case here, although I’ll wager that it was busier before ‘Spoons came. There was also no mention of the Diamond Club deal on the tables, only a couple of menus on the bar and a poster facing out of the window onto Church Street. £4.98 was the cost of my lunch today, and for that, I had a Costa cappuccino and a jacket potato with cheese, beans and a salad garnish. Service was quick and friendly, coffee was nice and topped off with a chocolate dusting. Jacket potatoes are funny things. OK not that funny, but the thing is, you don’t know what they are going to be like until you get into them and if you are doing jacket potatoes with 2 toppings and salad in a pub for £2.99 then the temptation is to use cheap ingredients. This isn’t the case at The Beacon. The substantial potato, the beans and the cheese were all good. As was the salad. This is a £4.00 dish discounted to £2.99 as part of the Diamond Club promotion. If I had one criticism, the potato skin wasn’t crisp enough, nor the white fluffy enough to rate an excellent, but this spud was comparable with others I’ve paid more for. You know what? I’d come back for more. Part of the £2.99 includes fish and chips, add to that a 99p pot of tea and you have a pub lunch for less than the price of a takeaway. At this price, I’m surprised that some of the Wetherspoons crowd don’t try this place more often. One reason might be the drinking reputation of the pub. It’s hard to be all things to all people, and reputations are hard to shake off. Something that The Station in Wellington will find out soon enough. What do you think of The Beacon?